. 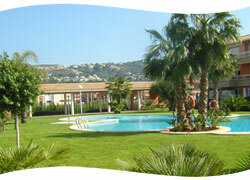 Luxury 2 bed apartment for Spanish holiday rental, superbly located in Javea, Costa Blanca, Spain. 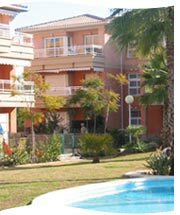 Situated in the coastal town of Javea on the Spanish Costa Blanca, this 2 bed holiday apartment is excellently furnished throughout, and includes all the comfort and luxury of any good home - an ideal self catering holiday rental. On the second (top) floor of the select La Senia complex, the apartment is complete with its own large balcony overlooking the communal pool, plus full satellite tv package including UK terrestrial channels, sports, movies and more. The lounge and the air conditioned master bedroom both lead onto the balcony, which is ideal for alfresco dining. Both bedrooms have air conditioning. La Senia is situated within a 3 minutes short level walking distance of the beach front, with the port area of Javea only 10 minutes away, and the safe sandy beach area of the Arenal 20. Restaurants, Banks, Shops etc are all nearby. 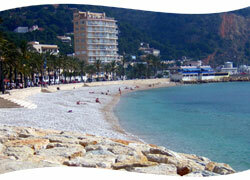 With more recorded hours of sunshine per year than any other place in the whole of Spain, Javea is an ideal location for all year round holidays. Browse the site for more detailed information on this luxurious self-catering Spanish holiday rental apartment and its superb surroundings in Javea on the Costa Blanca; an ideal location for your holiday in Spain. Christina who stayed in the apartment wrote to say, "a fantastic spot. The location is superb and the facilities are outstanding, the pool even in peak season was almost always empty. The apartment is luxurious and the booking and directions were made very easy by you. I shall highly recommend you to my friends and I will definitely be back."